TechAccess has unveiled its Unify SME Initiative and new promotion to partners. An update session introduced partners to the new initiative and shared details on rebates and promotions. Partners were also updated on Unify’s channel program, benefits, and TechAccess’ value proposition. The SME promotion is valid on Unify’s X3 and X5 Openscape UC bundles, and open to Unify partners in the GCC, KSA, Pakistan, Afghanistan and Levant. Partners who achieve and exceed their targets, stand a chance to avail of attractive rebates and marketing support. “Unify has an exceptional UC portfolio that caters to enterprises and SMBs, and they have recently stepped up their focus on the SMB segment in the region. TechAccess’ current promotion also targets the growing SMB segment, through which we offer enticing incentives, while continuing to support partners in selling a combination of the industry’s best UC bundles,” said Roshan Sequeira, Product Manager – Networks, TechAccess. Unify’s solutions allow organizations to unite multiple networks, devices and applications into an engaging, easy-to-use experience. 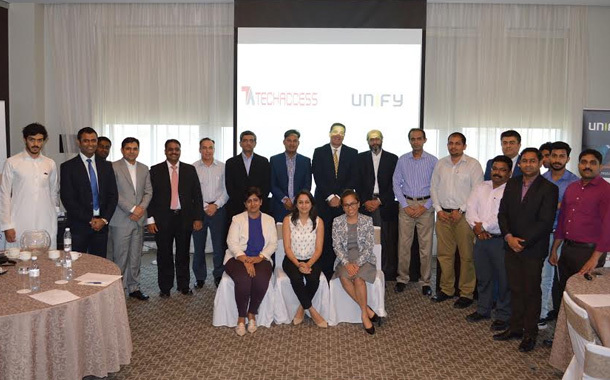 “The Middle East & Africa are key growth markets, and Unify is delighted to be working with TechAccess to address the burgeoning SME segment in these regions. TechAccess has demonstrated exceptional commitment to Unify, and we have seen some very encouraging results thanks to their strong SME partner network, market reach and expertise,” said Feras Zeidan, VP, Unify MEA.